Dr. Christine Blasey Ford is the second woman to appear in 27 years before the Senate Judiciary Committee to testify against a Supreme Court nominee. Unable to sit quietly, Dr. Ford came forward about a night at a party in the early ‘80s where she was sexually assaulted. It’s not hard to think back to 1991 when attorney and law professor Anita Hill accused then-nominee Clarence Thomas of sexual harassment. Hill didn’t have the backing of the #MeToo movement; she stood all alone, a black woman testifying in front of a group of white men. The statements made in that room by the Committee were not kind, Hill was not thanked for coming forward, she wasn’t called brave and she wasn’t believed. Hill was the only woman to come forward with accusations against Thomas. However, Dr. Ford is the first of three women to publicly accuse Judge Brett Kavanaugh of sexual misconduct. The make-up of the room at Hill’s testimony in ‘91 was only marginally different to today’s. Then, no women sat on the Judiciary Committee. Today, four women sit on the Democrat panel though no women are on the Republicans panel. Still, it’s clear the Judiciary Committee continues to be run by old white men. Of the members present during the Hill-Thomas hearings, three also appeared before the Kavanaugh-Ford panel: Patrick Leahy, Orrin Hatch and Chuck Grassley. Hill was portrayed as an angry black woman with wicked motives and a questionable background. Thomas’ supporters believed the tables were turned—that Hill was spurned by Thomas and was lashing out in an act of revenge on the largest public scale. Ten years had passed between Hill coming forward and Thomas’ sexual advances while they worked together. Hill stated that she only wanted to come forward because she felt obligated to share her account of Thomas’ character and actions. Thomas was inevitably confirmed and has since remained a member of the Supreme Court. The Hill-Thomas testimony has gone down in history as a failure, a black mark in U.S. history. The law failed Anita Hill 27 years ago, and the American people were not ready to believe her. Since then, there has been a shift in the country to believe sexual harassment and assault victims’ cries for justice. Without this shift, Americans wouldn’t have come to realize just how badly our justice system failed Anita Hill. A member of the United States Supreme Court sits on the highest court in the land. How could a man accused of sexual assault be trusted with the rights of many when there is the possibility that he crossed the line with one? Dr. Christine Blasey Ford came forward on Sept. 16 in a Washington Post article to accuse Judge Kavanaugh of sexual assault when they were both in high school. On Sept. 27, she testified to this in front of the Senate Judiciary Committee and to millions watching around the country and the world. 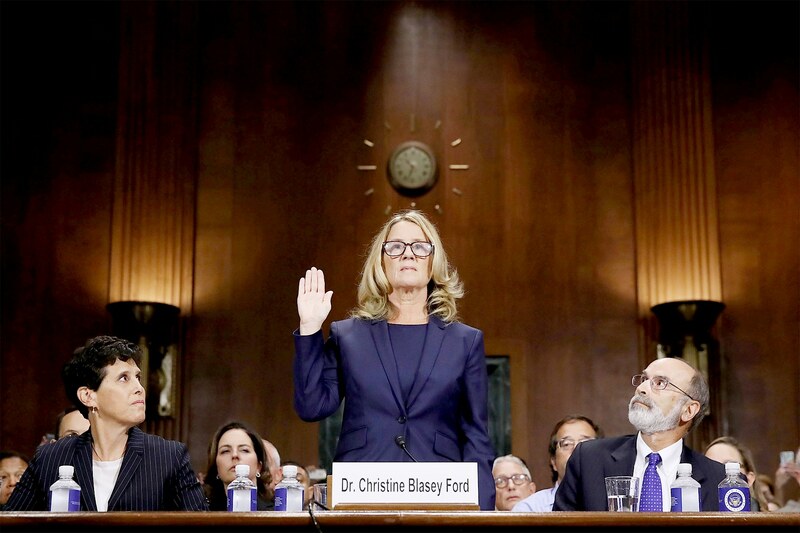 In her opening statement, Dr. Ford made a powerful declaration: “I am here today not because I want to be. I am terrified. I am here because I believe it is my civic duty to tell you what happened to me while Brett Kavanaugh and I were in high school. “My motivation in coming forward was to provide the facts about how Mr. Kavanaugh’s actions have damaged my life so that you can take that into serious consideration as you make your decision about how to proceed. It is not my responsibility to determine whether Mr. Kavanaugh deserves to sit on the Supreme Court. My responsibility is to tell the truth,” Dr. Ford said. Dr. Ford’s testimony was painful to watch at times. Dr. Ford didn’t hesitate with her response. “Indelible in the hippocampus is the laughter. The uproarious laughter between the two and having fun at my expense,” she said. To some, the missing details of Dr. Ford’s testimony are enough to disprove her credibility. But why? As adults, there are always those clear memories we keep with us no matter how old we get, and there are always those memories which fade. So why can the same not be said for Dr. Ford? Kavanaugh is a former attorney and current judge who sits on the United States Court of Appeals for the District of Columbia. On July 9, President Donald Trump nominated Kavanaugh to replace retiring Supreme Court Justice Anthony Kennedy. At the time, Kavanaugh portrayed himself as an independent-minded judge who would rule by the line of the law. But after his testimony, Kavanah looked anything but cool and level-headed. After a 45-minute rage where he took aim at everyone from the panel’s Democrats to the “national disgrace” of a confirmation process, Kavanaugh’s image of a cool demeanor took a hard right turn. So while Dr. Ford sat in utter terror, she still managed to speak calmly and politely and answered, to the best of her recollection, all questions aimed at her. But Kavanagh was aggressive, disrespectful and dismissive to every committee member on the panel. It brings into question his ability to stay impartial as he is confirmed to sit on America’s highest bench for the rest of his life. There was enough lingering doubt after Kavanaugh’s testimony that the Senate Judiciary Committee requested the White House call for an FBI probe into Ford-Kavanaugh accusations. Surprisingly, Trump agreed to the investigation. The FBI had one week to interview witnesses on both sides and then the Senate, barring no major revelations from the probe, could move forward with confirming Kavanaugh. Why is it required for a woman defending herself to be seen as calm and demure, but when a man is defending himself it’s perfectly acceptable to be disrespectful and aggressive? If Dr. Ford went on the offensive during questioning, would she have been seen as a credible witness? On Oct. 6, the bitter dispute of sexual misconduct against Kavanaugh ended. In a vote of 50-48, Kavanaugh was confirmed and sworn in to be the 114th Supreme Court Justice. Just like 27 years ago, a woman came forward with her truths and the American justice system brushed her claims aside. This system is deeply flawed, and until survivors are believed, we can’t move forward. I believe Dr. Christine Blasey Ford. I still believe Anita Hill and I will continue to believe anyone who has the courage to step forward. Sept. 30: A second accuser, Debbie Ramirez, comes forward with allegations of Kavanaugh exposing himself at a party in front of her 35 years ago. Oct. 1: FBI granted ability to question anyone deemed relevant after public pushback. Oct. 1: An old Yale roommate of Kavanaugh’s, James Roche, surfaces to talk about Kavanaugh’s behavior in college. Oct. 1: Bloomberg releases report of a drunken bar fight in Kavanaugh’s Yale days. Oct. 2: Mark Judge is interviewed by the FBI. Oct 3: Trump openly mocks Dr. Ford at a campaign rally. Oct. 4: FBI completes investigation, yet neither Dr. Ford or Kavanaugh are questioned. Mitch McConnell announces Senate will convene on Friday to vote. Oct. 5: The procedural vote is 51-49, advancing Kavanaugh’s nomination. Oct. 6: Brett Kavanaugh is confirmed to the Supreme Court with a Senate vote of 50 – 48. Sept. 12: Hill first tells the committee of the sexual allegations against Thomas. Sept. 20: An FBI investigation is suggested. Sept. 23: Hill agrees to allow the FBI to investigate the allegations. Sept. 26: FBI completes its investigation, and a report is submitted to the White House and the Judiciary Committee. The report determines the allegation was unfounded. Sept. 27: The committee deadlocks 7-7 on whether to recommend the Senate confirm Thomas’ nomination. The panel then votes 13-1 to send his nomination to the Senate floor without a recommendation. Oct. 11: Hill testifies that Thomas had sexually harassed her while she worked with him at the Education Department and Equal Employment Opportunity Commission. Oct.15: The Senate confirms Thomas in a 52-48 vote. Oct. 23: Thomas is sworn in as an associate justice of the Supreme Court.